Sometimes we just do not anticipate all the details that have to be considered when installing a curtain rod. Curtain rods come with different projections from the factory. The projection you need is determined by the type of window. If you are not mounting the curtain rod on the framing, then you need to consider how far off the wall the framing projects, and how much clearance you need from the curtain to the frame. Projection brackets are sold separately to take care of these "after the fact" problems. 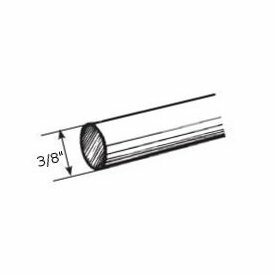 They can add 3" or more to the standard projection of your curtain rod. Most traverse rods have enough slides for the average drapery. Sometimes, when you are using the adjustable rod at it's maximum width, there may not be enough slides. Extra slides are available for all major traverse rod brands. Some are made out of a plastic like material that slide across the surface of the rod, while others are designed with ball bearings to carry heavy drapery material. If you are using more than one traverse rod and the sizes are different, you may have extra slides on one rod that can be transferred easily to the other. Most traverse rods come in one way and two way draw configurations. Double configurations normally come in the two way draw setup. A two way traverse rod can be easily converted to a one way left or one way right. Another way to accomplish the goal of a double, one way draw rod is to use two single, one way left or one way right traverse rods and get available double brackets and supports for the installation. Motorize your curtains and shades with Somfy proven products. AC and DC motors available for most products. Remote controls, switches and other accessories available at good pricing. Wide assortment of hooks for elegant tiebacks to hold your draperies to the side of your window for more view. Also, many different size fabric tiebacks available to to dress up your treatment. Fringe and other trimmings from Conso in hundreds of colors to finish off that project you started. Outdoor shade fabric will soon be available in cut yardage or full rolls. Several patterns and colors for your selection. This is the last in the series of 101 Drapery Hardware information spots.The Kirsch swivel socket is ideal for solutions for windows up to 90 degree angle including bay and corner windows. These are available for wood and steel curtain rods of varying diameters. If you have one of these windows in your home, and you want more than our standard corner curtain rod, this is an attractive solution. Today, we will give some insight on traverse rods. One way left and one way right traverse rods are available, and double traverse rod combination are also available. Heavy duty, light duty versions are available for the right job. Bulk users can save on large use jobs like commercial, hospitals and motel/hotel establishments. Today we are going to go over drapery hardware finials. Brackets should be installed securely into wall studs, when possible. We recommend using a professional installer. Brackets should be placed every 4'. We do not recommend installing brackets with more than 4' between brackets. For non-pleated draperies, we recommend 4 rings per foot. Rods can be spliced together using connector screws or rod splices. Plan the location of the spliced rod so taht it can be placed behind a bracket.